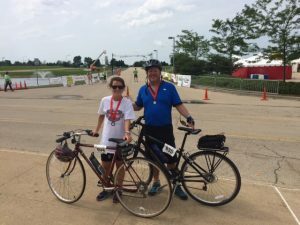 July 1, 2015 – DKI, North America’s largest disaster restoration contracting organization, today announced that its Chief Financial Officer, Don Cox participated in the 35-mile Bike MS: Tour de Farms 2015 on June 27 and 28 as an effort to raise money to help cure Multiple Sclerosis. Bike MS weekend is an annual occasion for people to gather and ride for 35 to 100 miles each day to raise money in support of finding a cure for MS. Every mile rode and every dollar raised makes a difference to the 2.3 million people worldwide living with MS. This weekend’s event took place at the Northern Illinois University Convocation Center in DeKalb, Ill.
“This is a fabulous event sponsored by the National MS Society. I am glad I could donate my time and round up some contributions for this great cause,” said Don. Learn more and get involved by visiting www.nationalmssociety.org/Get-Involved.